The Obama administration ran an August deficit of $192 billion. 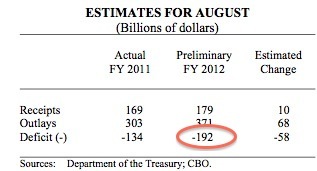 This CBO analysis shows a lot of bad news, fiscally, in August. Receipts were only up $10 billion over last year. If the economy was in any way, shape, for form, in any sort of recovery, receipts would be much higher. Next, spending increased by $68 in August of this year over August of 2011. I thought Obama wanted to reduce the deficit? 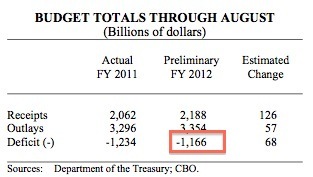 Finally, the deficit for August this year is some $58 billion greater than the deficit in August of 2011. In other words, spending control is basically non-existent in Washington. For the fiscal year, so far, the deficit now stands at $1.17 trillion dollars and FY 2012 still has one month to go. One other observation…. Obama’s, and the left’s theory in general, is that massive government spending equals improved economic conditions. So this fiscal year, as a nation, we have in essence had a “stimulus” of $1.17 trillion dollars. So, the theory was proposed. The theory was tested and with this economy still in the doldrums. A sane person would reformulate their hypothesis, yet the Democrats and President continue to deficit spend with little if any positive impact.